After you purchase a KVM VPS you will soon receive an e-mail with your login credentials. The E-Mail would contain the root password and the IP of the VPS. Once you have received info you are ready to go. Now must know How to connect to VPS, the following steps depends weather you are a Windows user or a Linux user. First you have to install a SSH client – SSH is shorten for secure shell which is a protocol that allow computer admins as yourself to access a remote computer securely-. 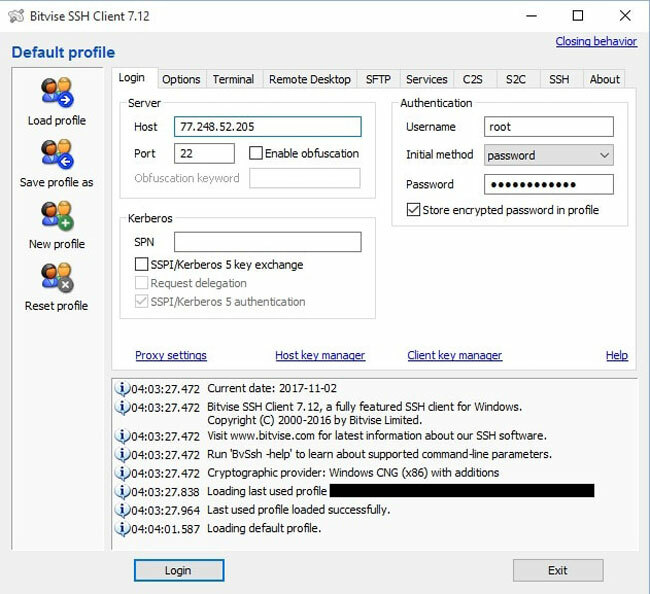 There are many SSH client software for Windows for example bitvise, putty , ….etc. The default port for SSH is 22 and that is the port of a new VPS. We will change that later but for know put the IP address, the user (root), the password and the port number (22). Once you press login a connection with the VPS will be established and you can now manage your VPS. Through Linux distributions logging to your VPS would be more simple you don’t have to install any software. All you have to do is to type the following command. You would be prompted with a message type yes then enter the password and press enter. Now you can establish your first VPS connection with method suites you as above. It is highly recommended that you take some security measures. Here we would suggest simple but very effective security precautions. The first securing step that you’re advised to change default root password that generated by our system to do that just login to your VPS and type the following command. You’ll be asked to enter a new UNIX password and repeat it one more time before it is set. Choose a strong password consists of upper case and lower case letters as well as symbols and numbers. One of the simplest most effective ways to secure your VPS is to change the default port. To enable login to the VPS without the use of the root password. We have to create SSH key pair. The SSH key pair consists of a public and a private key. The private key is on your local machine while the public key is on the remote server. Once both keys are matched you can login to your VPS without the need of the root password. You will be prompted by a message to specify a place to store your key and another one if you want to add a passphrase. You can skip both. Now you learned How to connect to VPS and how to secure it, this is just the first basic steps to manage your VPS. you must add more secure items as your machine require, whatever software you’ll run to fit your web application you almost need security in each component you will use, we will try add more security options in each upcoming tutorial for all user’s level , keep around and add comments we will reply soon.